To describe such a unique, memorable and admittedly a slightly eye-opening experience is not so easy when there is so much cool stuff to recount! 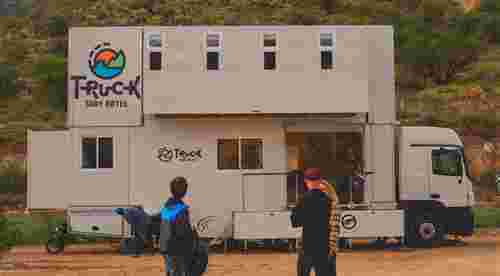 This is a Surfbunker review we've just carried out on a new surf venture, which at the time was located on the rugged and wave littered shores of Morocco. This new business concept isn’t only found there, this new venture is mobile!! They can be found travelling along the coast of Morocco and can also be found on the vast shorelines of Portugal, living the search, living the dream and always happy to share the adventure. First up, let me happily introduce to you the ever smiling Edu and Daniela who both hail from Portugal. They are the proud owners and operators of the Truck Surf Hotel. They offer a unique way to experience a surf holiday and how to do it right, pure and simple. There is some swell in the water and Edu and Daniela know exactly where to go. What we are about to review is in essence, a surf camp/package holiday and who better to send than someone who doesn’t like such things ... yup, that’s me! I’ve had the privilege of working in that business for a fair bit of time. For my surf trips, I prefer the freedom of living the search in my own van with no restrictions and to get away from the crowds. So I packed my bags, hooked up with my photographer pal Nico and headed off for a surf holiday with my eyes wide open to the fact I was sure I wouldn’t enjoy it ... it turns out I was really pleasantly surprised and wrong about a few of my own opinions! Edu is the man with the plan. Loves surf toys and probably got something for everyone stashed away on the Truck. Now please, believe me, I’ve been living and breathing this tourism environment and lifestyle for 20+ years. I’ve experienced working and staying in a lot of these ski\snowboard\surf packages, so I feel I have a fairly qualified opinion. I’ll get to the point, these guys know what they're doing and I honestly can’t emphasise enough that this is not your normal surf holiday package, not by a long shot. A unique and luxurious hotel on wheels for guests to explore and discover the surfing spots of Morocco and Portugal, whilst mixing it up with expert surf coaching and guiding for all levels. The guys at TSH are born adventure seekers, having spent much of their adult lives travelling and surfing around Europe and Africa, whilst living in campervans in various countries. They truly know what it is to be a surfer nomad on the road, living the dream and living the search. They have the skills and experiences to offer guests an insight into that lifestyle, the surfers' life. Daniela doing some 'old school' haggling. The focus isn’t just about the surfing either. The guys have worked in the tourism industry for many years and offer a well-rounded experience. They were super active in introducing us to local cultures and finding fun things to do and see. Our days had a whole mix of surf, chill, eat. explore, discover and fun ... no doubt about it, you won’t go bored when you’re not on the board. Honestly, the truck is wickedly awesome and comes fully equipped!! It's like the coolest Transformer ever. The trailer literally grows and expands in front of your very eyes!! Thanks to its hydraulic system, the ceiling rises to create the second floor where there are 4 shared basic double rooms with bunk beds and 1 couple's room with a double bed. The truck can sleep up to 10 guests, although they aim to invite up to 8 guests only so as to avoid overcrowding. If that wasn’t enough, the sides expand out sideways to create even more living space for downstairs, it's crazy cool. Nic, deep in thought, maybe this could be the way forward? The photos don’t do it enough justice. Firstly, it’s actually bigger than it looks. I’m not saying it's mansion size in reality, it’s still a truck after all, but for sure bigger than one might first think. The inside is decked out nicely with wood and surfy style decor. The kitchen is fully equipped and set up nicely. Some nights we chose to stay in and cook for ourselves as a crew, enjoying a few drinks together and listening to the trucks impressive surround sound system. There’s one shower on the rig and it’s a bloody fine shower too!! Seriously, everyone that stepped out for the first time would stand in amazement and state ‘that is an incredible shower!’ and then pad off to get changed ... perfect after a day out and about. After a long day of surfing, eating, exploring and adventure, we all found ourselves genuinely excited to be going back to our home on wheels!! Journeys into places full of intrigue and mystery. To run such a truck with 7 or more people living in it isn’t so easy!! It’s incredible the amount of work that goes into running the behind the scene details and the guys are always on standby to fill this, fix that, help there, help here, empty that, answer questions, then more questions and all with a genuine smile and eagerness to help out. So the big truck doesn’t get packed up every day and drive on to the next spot up the coast, it would be a bit of a mission doing that on a daily basis. So it gets parked up for 2 or 3 nights at different campsites along the coast, all depending on surf and weather conditions. It’s a great way to explore a few different areas whilst on your holidays and keep the same standard of living and customer care throughout the travels. Ok, so the big hotel truck isn’t designed to be a surf searching vehicle. That’s where the 2nd truck steps in and it’s a beast in itself!! It’s a 9 seater Merc and has a box container on the back. Now this container is big, you can stand up in it!! It’s been kitted out to secure and carry all the toys with board racks and wetsuit hanging facilities. Here she is in sleep mode, everything you could want in a surf travel holiday. So in the morning we’d pile into the Merc and hit the road searching for waves or food, although mainly food in the end as the weather was so terrible when we were there! Both Edu and Daniela are qualified surf instructors with years of experience under their belts. Edu has spent time competing and being coached in various different surf disciplines, he has a wealth of surfing insight and some serious shredding skills. They offer safe and fun surf coaching for all levels of surfer. I’ve been a snowboard and surf coach spanning 20 years and having spent the week with them, I can see they offer a hands-on approach and they're always on the lookout, giving advice and feedback where needed. Time to roll up your sleeves and slip on your haggling gloves. They also try to capture you on film and offer super valuable video feedback coaching. This is done whilst checking out your days' waves on the screen back at the truck over a couple of cold ones. When it comes to guiding, you can have complete faith in their knowledge and experience to score amazing waves, of that I am 100% sure. I’d be really keen to book the whole truck with my pals and hit the coast searching for uncrowded spots with their insider knowledge. They have some seriously fun kit!! I almost didn’t need to bring my own sticks!! They have a great variation of boards, spanning from beginner foamies, novice to intermediate boards in varying sizes and a few funboards to try out. Taking a stroll, sucking in the local scene. Edu loves toys, anything that looks fun and maybe a little bit crazy, he’s probably tried it!! He has all kinds of kit and might even have a few kites hiding away in there for the windy days. Breakfast is provided and I’m sure will change from location to location. On our week, it was a fairly basic affair of local bread, local banana’s and fruits, some cereal, yoghurt, cheese, tea and coffee. It’s so cheap to eat out, so for all lunches and dinners, we checked out the local foods, mainly a lot of Tagines, followed by Tagines ... oh, and avocado milkshakes, which are amazing!! A little look inside the spacious pop up truck. Some nights we just cooked together at the truck and enjoyed the downtime. Pro’s - You’re travelling and exploring in an awesome Transformer Surf Hotel on wheels ... can’t get more unique than that!! I think they're taking the concept of surf camp/package holidays to another level with a touch of cool class. If I was to score this surf package out of 10, I would give them a solid 8 to 8.5 … and I don’t like surf package holidays!! The week we were staying, we had a ton of rain and not such good waves, yet we came away having thoroughly enjoyed our week. Stargazing by night, just another day at the office. Combine their personalities, their products and their skills, you have a winning combination that will only get better and stronger with time. I think Edu and Daniela are super approachable, generous, kind folk and they will go more than an extra mile to please anyone staying with them at Truck Surf Hotel. They really treat you like family and you’ll leave feeling part of something very cool and unique. This for me really makes a trip, if all else fails, like bad weather, no waves, then you need a solid team in place to lift the spirits and make you make the most out of your holiday, this they do for sure. Hidden away from the crowds, stay surrounded by nature in the pop up Truck with a view. When it came to the surfing, we were all varying abilities, from beginner to almost advanced. I was worried that this would be a problem catering to all levels. This was one of my biggest concerns for my holiday because I don’t want to waste a week of good surf chasing white water waves! I needn’t have worried, the guys will hunt waves for all levels till the sun goes down!! If there had been epic waves, I’m very confident we’d all have been surfed out and content. They have a very well stoked choice of boards and gear to choose from, spanning all types and sizes to play with. Although I didn’t get any coaching, I can see how well they cater for all levels of surfer, even to proper advanced level coaching. They take the time with each student and the learning doesn’t just happen on the water, also during the day, at the dinner table, over drinks, whilst chilling ... they have a big projector set up so you can check out your days' video footage and get tips to improve. Edu is the man that is always full of stoke. One of your hosts at the Truck Surf Hotel. The day is fairly packed and you will have to follow the group flow, which I didn’t think I’d enjoy, but it turns out it’s a bloody nice feeling having someone else making the decisions!! This only works when you can trust those leading the group ... which I did. Con's- They advertise it as a luxurious hotel and it does have a touch of class for sure, but I wouldn’t say it was your 5-star luxury and you shouldn’t go there thinking it is. It’s also advertised as a hotel, but don’t expect a chocolate on your pillow, fancy shower soaps, towel robe and slippers like most hotels that call themselves luxury. Like I said, it does have it it’s luxurious touches, but you must keep your eyes open to the fact that it is a truck after all and space is limited. I'd compare it to living on a boat and you have to share the space with potentially 8 people, combine that with 1 shower and 1 toilet, you have to be flexible. We had a good week of cool people and this was never actually a problem, just something to bear in mind. I also found storage a little limited, I would recommend travelling light. Breakfast, it’s not the worst I’ve encountered for sure, but I felt it didn’t meet the luxurious standard you might expect staying in a luxurious hotel. It was very basic, cornflakes, chocolate cereal, basic local white bread, bananas by the truckload as they're locally grown, a block of cheese and some sugary yoghurts. From experience, especially when catering for surfer type people (especially the German market), they will expect more and maybe some healthy options such as unsweetened muesli, brown bread if possible, honey, natural yoghurts and some small touches of variation during the week ... just a small detail, but mum always said ‘breakfast is the most important meal of the day’. Getting back to the Truck after a day out is like coming home to chill. After having spent the week with the guys I had a few questions to fire at them and they were more than happy to reply. SB: Hiya Edu and Daniela, I hope you guys are well. Firstly, I want to thank you for a great experience you kindly shared with us, it really has left quite an impression. TSH: Hi Nick! Thank you, we also had a great time with you guys, awesome vibes! We are really happy you came for this experience! At the moment we are in Portugal, on the way to a WQS competition in Santa Cruz, where the Truck will give support to the organization of the event. ☺ After the event, we will follow the southwest coast and start our surf trips! We will travel between Sines and Lagos, every week until October. This coastline its really awesome with high cliffs, blue clear water and good waves for all levels. There are more than 70 surf spots to explore and nature is all around. We will have lots of barbecues and visit some of the most traditional villages in the area. Taste the local foods, possibly one of the most underrated cuisines in the world. SB: How was the concept born? TSH: The concept came from the time we were travelling in our campervan through Europe and Africa. As surfers and explorers, we felt the need to share this lifestyle with others, in a way that we could offer flexibility to travel but at the same time comfort. So Eduardo gave me the challenge of starting with this project, a hotel on wheels! At first, I thought it was a bit crazy, but then we found the right company to help us with the conversion and Eduardo’s ideas became reality. Immerse yourself in the local culture. When you stay with the guys at TSH, wherever you are, this is what you get. I little bit of cultural shazzam. SB: Myself and a few readers have already asked, how much did the truck cost to build? TSH: It was not cheap for sure ;) but I can tell you that a truck like this costs around 400.000€ in Portugal, which is quite a good price comparing with other European country rates. SB: How long did it take to build the hotel on wheels? TSH: From the moment we start projecting together with the motorhome company until it was on the road, it took a short 9 months to make it ready, working almost every single day on it. It's surf time, better study that lineup. Maybe a shorter board. Ohh decisions. SB: What was the hardest stage of building the truck? TSH: From what we remember it was actually the legalization, because we imported the truck from Holland, before the conversion, and it was 9,15m long. In Portugal the law allows only 9m long, so we had to cut the chassis, which delayed everything in 1 month! SB: Having now spent time living and travelling in the truck, are there any changes to be made for the next leg of your trip? TSH: There is always upgrades to do, we are pretty happy with all the experience! But one thing is to create more storage inside the truck. People already feel in a home when they are inside, feel cosy and have their full privacy with our individual rooms, but a little closet room will help them to store better their stuff. You know the moment you caught a wave. That was this. SB: Who do you think the trip you offer is best suited for in terms of family-friendly, big group friendly, teenagers, 18+, 25+, singles, couples, etc? TSH: In my opinion, as the whole experience is so diverse and flexible, and everyone normally connects with each other in a good vibe way I think it suits all kinds of groups such as families, friends, teens, singles, couples people travelling alone, etc… We adjust the program to each group so we fill more their needs. Normally the persons who join us on the trips are aged between 25-35 years old. SB: What future plans are there for you guys? TSH: We have a few surprises in the next coming year, we invite you to follow our next steps on our Facebook and Instagram pages. Our idea is to keep on doing this surf and adventure trips through Europe and Africa and … who knows? other continents ☺ We will also be on different kind of events such as surf competitions and music festivals. SB: Can you share any cool fun facts we might not already know? TSH: We both can drive the Truck, we both have the driving license. Next year you will see me (Daniela) more on the big truck steering wheel. Our man Nic, heads off for an early session with that Slater(esq) silhouette. SB: Is there any other info you think our readers should know? TSH: I think you already explain it very well Nick, thank you! Just wanted to say that we have other kinds of packages besides the surf experience. So if someone has a dream trip that they would like to do, share with us and we will create a route adjusted to that experience. Editors note: All the photos in this article are courtesy of a very talented up-and-coming photographer and general legend, Nico De Voogd. Keep your peepers peeled for an upcoming chat with Nico and how the world looks through his lens. In the meantime, here is what he has been up to. Legend. The Expanding Lorry that we call the Truck Surf Hotel. Nic Spiers checking out the business end of the truck. And the boys are off, time to get some waves. It's time to hit the road again as another load of guests leaves happy and full of stoke. The second truck is a Merc with enough space to get everyone and everything where it needs to go. It's surf time, the best places are often the hardest to find. Be a local wherever you go when you stay in the TSH. The top floor of the truck is dedicated to bedrooms. Yep proper bedrooms with doors. That is the part that keeps it fun and interesting. Plan-B´s, we have lots of them..... e.g. ice climbing, SUP, sk8, snowboard, caving, hiking, snorkeling/diving, atv adventures, horse back riding, rafting, sight seeing, hot pools, paragliding, super jeeps..... the list goes on and on.